Dr. Plummer received her bachelor of arts degree from Williams College and was awarded her medical degree from Mount Sinai School of Medicine. She completed her orthopaedic surgery internship and residency at NYU Hospital for Joint Diseases. She remained there as a sports medicine fellow, and worked closely with the team physicians for the New York Rangers and Alvin Ailey Dance Theater. She has published multiple articles and book chapters in the field of sports medicine. She finished her fellowship training in 2013. Her area of clinical focus is all types of orthopaedic sports injuries, including injuries of the shoulder, elbow, hip, knee, ankle and foot. 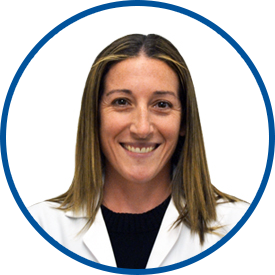 She is trained in all fields of orthopedics including arthritic joint conditions. She has special interests in the female athlete and adolescent sports medicine. Dr. Plummer joined Westmed in August, 2015. Dr. Plummer understood exactly what I was hoping to get from my appointment with her. She was perceptive and thorough and made me feel that I was part of my health care decisions. I would recommend her highly to any and all. Dr. Plummer is very knowledgeable.. not to mention friendly, courteous and patient. She took the time to carefully explain information, follow up procedures and medication. She was thorough and never rushed me out of the room. I am very satisfied with her level of expertise and bedside manner & would recommend her to anyone over and over again! Dr. Plummer is fantastic! She came in early (7:45) before her scheduled hours to give me a cortisone shot when I was in excruciating pain. She responds to e-mail extremely quickly. She is sensitive to my medical concerns. She's a great doctor and Westmed is lucky to have her! I am blessed to have found this provider. I absolutely love *Dr. Plummer! Very good rapport. Very caring. Followed up with phone call personally. Completely trust Dr Plummer and will continue to visit as needed and will definitely recommend to others. She is an extraordinary doctor! She showed remarkable medical proficiency and patient concern. Dr. Plummer includes her patients in a discussion org her reasons for reaching a diagnosis. it is a great education , as well to be her patient. Dr. Plummer is an excellent diagnostician, treatment specialist and has the best bedside manner and communication with patients that I have ever experienced. She is the gold standard of a physician that cares for and has a genuine in her patient's comfort and care. I was very pleased with the care and attention that Dr. Plummer gave to my 4.5 year old. I would recommend her to anyone.